Annuity is a contractual financial product created wherein funds, accepted by an individual, mature over the years and then at a later point in his life, especially after retirement, these payments are provided to him in order to generate a steady income. To simplify it even further, an annuity insurance plan is a policy provided by insurance companies that provide you a steady income stream by way of periodic payments to you after accepting a lumpsum amount as premium or purchase price of the plan. Initially, you make an investment in the present in order to receive guaranteed payments in the future. 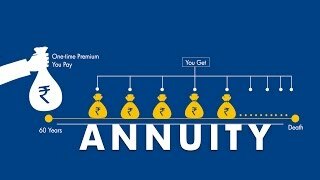 Therefore, an annuity insurance plan which is essentially a pension plan might be an interesting retirement strategy especially for those who do not have any such plan. The duration of time when the money which comes from the individual is being collected is called the accumulation phase while the annuitization phase begins when the payouts to the individual begin, which is usually after retirement. The upside of annuity insurance plan is that the amount of money which you invest in the insurance policy builds up tax-deferred. The money that you invest in the annuity insurance plan is not subjected to tax but the withdrawal of your earnings is taxed at the typical income tax percentage. And a tax penalty is enforced if and when you make any withdrawals before a definite, stated age.